Eclipse Datatools (DTP) gets Amazon AWS SimpleDB Support! 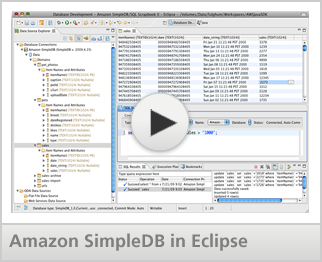 Great news for Eclipse community and SimpleDB fans -- Amazon AWS team released Amazon SimpleDB Management tool that is built on top of Eclipse Datatools! SimpleDB Management in Eclipse lets you access SimpleDB to create, edit and view domains, items and attributes without writing a single line of code. Additionally you can use SQL Scrapbook to write SQL select queries with the help of auto-completion. See http://aws.amazon.com/eclipse for more information and download instructions! AWS Toolkit including SimpleDB DTP integration is licensed under Apache License 2.0 so it is free to download.